On July 3rd, over 350 participants and observers gathered for the latest Fete de Presentation at College des Savior (CS). The Fete de Presentation is a tradition at CS, where students prepare skits, poems, songs, and other creative efforts to educate the community about what they’re learning and to celebrate the students’ academic and service-based progress. Present at this Fete were CS teachers and staff, teachers from other community schools, including a group from Lukunga, who GBA has been partnering with in its Teacher Learning Circles, community representatives, such as a representative from the IRC and a local head of education, and non-student children from the area. In addition, there were about 60 parents and 130 students at the fete as well. The Fete included student presentations, a speech from Dr. Jerry, and a community fundraising effort. Students showed the audience examples of the square foot box gardening method they will be using for their Student Learning Gardens and demonstrated what waste materials to use for composting and how to use compost in the most productive types of gardening techniques. Reactions from the Fete were enthusiastic, focusing on the students’ valuable and unique ability to speak in front of large crowds and to convey to the public the important lessons they’re learning. 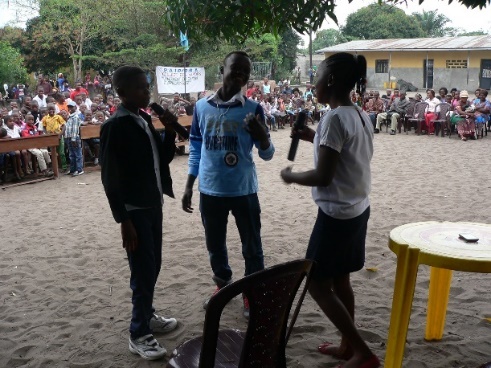 The Director of Lukunga was surprised by the students’ performance. 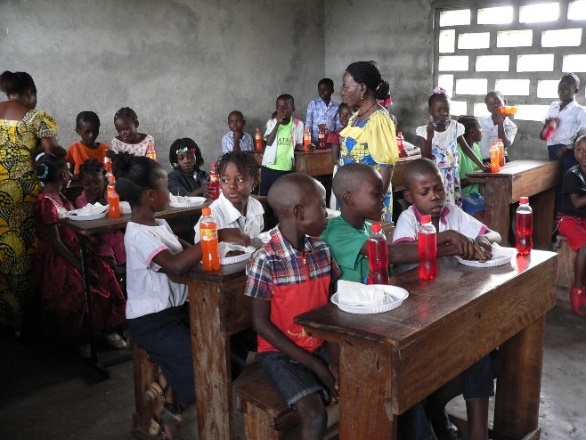 The Director of the Kapini Primary School, Mr. Bena, described the students as active, well-adapted, and not scared. Mr. Gaston, President national de CISDC (Comité intersectoriel de développement du Congo) said he will ask for support for the school. The community-centered work of the students shines through in the community’s reciprocity in their eagerness to support the school. 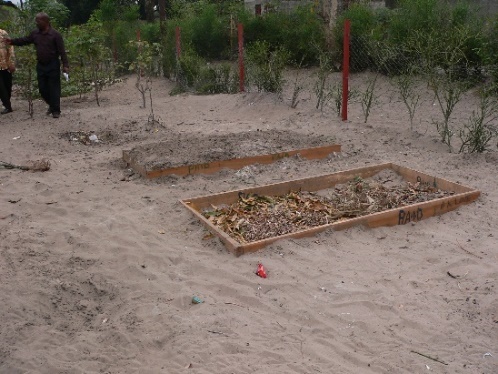 The students will now be on summer vacation, but they will continue caring for garden square foot boxes over the break and are moving closer and closer towards realizing their dream of developing a Students’ Learning Garden. In mid-January, College des Savior and the community came together to support the students in their fete de presentation, a celebration and showcase of what they’ve learned over the past few months. A wide variety people were in the attendance, including 60 parents, 14 teachers, 3 school staff members, 2 members of GBA, NGO representatives, and other special guests from the community. In total, 140 students were a part of the fete. Dr. Jerry provided opening words. Students and parents gather together. 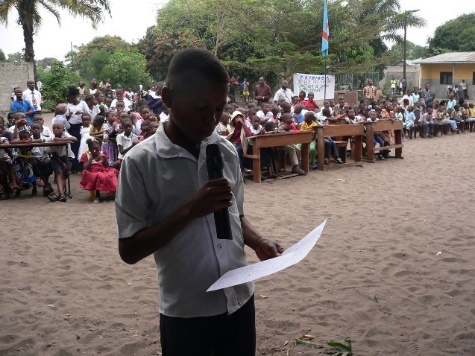 The event had an official ceremony and presentations from students in the form of skits, poems, and games. The presentations centered on the themes of social connection, conflict management, and teamwork. 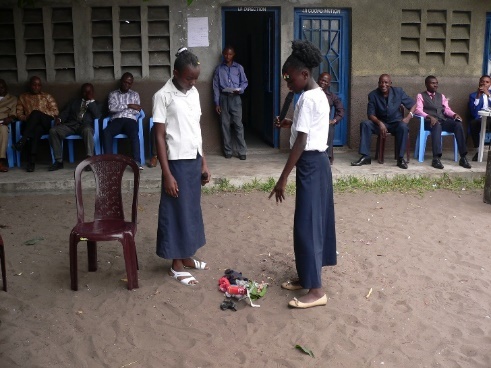 One group of 4 students put on a skit that involved resolving a dispute amongst friends. They came up with the idea and took the lead in crafting the skit. The attendees and participants alike were positively impacted by the fete. One even felt inspired to offer books and training to the teachers. Many community members expressed a desire to spread the word about the fete and College des Savior students. The Inspector General Adjunct: “I did not expect that these children would teach us like this. This event should be broadcast on television to get other schools to see it." Parents were able to see the kinds of skills that their children are learning. After the fete, the school as a whole and the parents both had time to reflect on their role in and the lessons of the event. It is not often that we get to gather so many members of our diverse communities together. We recognize that the students are catalysts for this kind of social cohesion and know that they will continue to inspire people in the Congo, the U.S., and elsewhere. We are excited to share the latest updates from our community service actions, or CSAs. CSAs are student-led projects that help students to share with the community what they've learned in school. 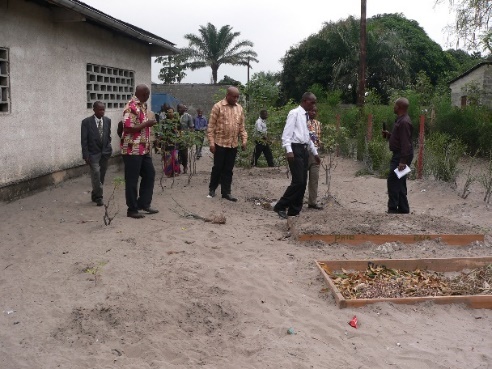 CSAs also enable students to lead change to solve real community issues, such as improper waste disposal. In CSA #1, students went out into busy areas and picked up waste. Community members wondered what the students were doing and engaged with them in conversations about waste management. Read more about the CSAs and the philosophy behind them. Students started CSA #2, home visits, on the 2oth. Eighteen students and their teachers went out and visited twenty-six households in order to share news about how to properly handle waste. The students' work allows for safer community practices, shared information, increased self-confidence for the student leaders, and a chance to show how important an asset education is for everyone. The day began with preparation and briefing in the classroom. Students practiced what they wanted to say, and the teachers led them in a simulation of a home visit. Next, the groups went to the homes. Adults were amazed to see the children speaking with such self-confidence. Respect and hospitality abounded during the visits. Students reported that people were interested, kind, encouraging, and asked questions. Many had not know much information about waste management before the students' visit. Student Tshibola said the positive reaction was, "because we approached people with respect, greeting them, and explaining clearly the reason of the visit." Additionally, Beya Beya explained the reason of the visit so well that one father listened diligently and then decided to separate biodegradable waste from non-biodegradable waste in his garden. After the visits, students went back to school to reflect on their experiences. They are anxious to be able to continue the home visits! They will finish the home visits, then revisit families on August 3rd to follow up and invite them to the mini fete, CSA #3. At the mini fete, which will be on August 10th, the students will perform more skits, dances, and poems about waste management with hopes to reach even more community members. The students are also working on creating a map with clean water and waste management details that they can share with friends. The mini fete will present lessons similar to those that were presented during April's fete. It will further emphasize the effects of an education and of proper waste treatment. The students continue to work tirelessly to make these CSAs a success for all! “I am taking this moment to thank GBA for having always thought of PAID (Centre Salisa) in terms of support of all its activities. The organization [of the fete] was impeccable. The guests (notably some authorities from N’sele, UNICEF, and World Vision), the parents and other people in the community were all very animated with joy to see these students well formed, presenting with courage and good speech the poems, the small scenes, songs and dances that conveyed the biggest message relating to the good management of waste to prevent illnesses. Immediately after the ceremony, since the work had been well done, the mayor’s representative and the distinguished guests congratulated us, encouraged us, and asked if we could develop the projects for the popularization and implementation of this message. The parents were also content with the development of their children. We share Rodin’s vision of a changed Congo. Our amazing students are using their education to shape the community.We are committed to continuing this remarkable work. We also thank you for you continued support, which makes all of this possible. 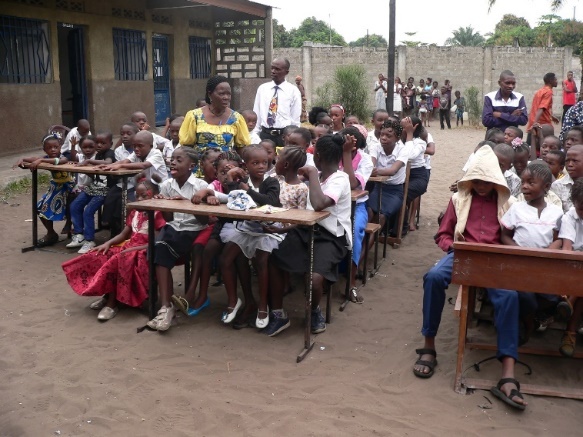 Hear more stories like this at our September 5th gala, Congo: Continue the Story. The next step in the waste management curriculum sends Centre Salisa students into the streets. Our highest priority is enabling students to lead change in their communities. When a student becomes a child leader, there are increased benefits to the community and increased self-esteem and learning reinforcement for the children. There is also an awareness built around Giving Back to Africa’s presence in the community and the importance of schooling and topics such as clean water and waste management. Community service actions, or CSAs, encourage child leadership by giving kids space to apply classroom learning to the real world. The students identified three CSAs for the summer months that will seek to solve problems related to waste in their neighborhood. First, students revisited the market area to gather waste. By publicly picking up litter, the children raised questions and conversation with community members. The oddity of the clean up gave kids a chance to talk directly about waste. Community members were eager to learn more about Centre Salisa and about waste management. The kids' actions inspired community members to make changes in their own lives about how they handle waste. Many students said that they wished to return to pick up waste often. Student Kipulu said, "Several people congratulated us and asked us to return again to pick up the waste and advise people." Students prepared to answer questions and start up conversation after reflecting on the most important points they learned during the waste management curriculum. Students and the Noyau, our teacher team, met to determine these important talking points together. Talking points gave students more confidence when speaking with community members and allowed them to pull out points of waste management lessons that were most meaningful to them. Look out for a blog post later this week with more details about CSA #1. Next up: home visits. After this first CSA in the market, students and teachers will reflect on the outcomes and prepare for step two, the home visits. They will decide what they find most important to talk about and then visit homes in the community to share the information they’ve learned about waste. This will also allow for staff to be able to reach children in the community who are pre-school aged or out of school. The home visits will be able to provide concrete proof of the value of an education, and again, it will strengthen the self-confidence of the students in being able to take a stake in their community and in talking with adults and community leaders. In addition, the home visits will provide students with an opportunity to invite parents and children outside of the school system to a mini fete de presentation in late July/early August. The mini fete is CSA #3 and will further emphasize the effects of an education and of proper waste treatment. Students will be able to take their learning leadership to new heights! Supporting child leaders is our goal. The students work tirelessly and are truly shining, in classroom and out. Through the CSAs, the students hope to continue making positive impacts in own their lives and the lives of others. They also hope to open up conversation, in all parts of the globe, about education, child leaders, DR Congo, and more. The students at Centre Salisa prove what a difference communication can make as they step into the neighborhood and into their roles as community leaders. On May 18th, a fete de presentation (literally translated as "Feast of Presentation"!) gave students a chance to celebrate and show off the waste management skills learned in the second youth leadership education module. 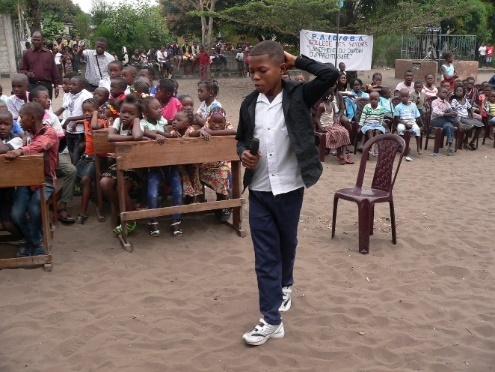 Students prepared dances, poems, songs, and skits to teach community members about waste management. Their goal was to educate community members about the risks of handling waste improperly. After the fete, the teachers and students alike reflected on their performances and overall feelings about the fete. The consensus was that it was a fun and informative program for all. Before the fete, some students had reported being nervous or worried about speaking in public, but their fears were met with strength at the performance. After the fete, students felt that their hard work had reached a vast audience, and teachers and students alike reported an astounding sense of pride in their achievement. Students went on to identify the next steps in carrying out waste management projects in the community. These next projects aim to continue learning, reinforce waste management lessons, further connect students and the community, and increase awareness about both waste and the students' work at Centre Salisa. We call these projects community service actions, or CSAs. With the brilliant leadership from these students, we are sure to see continued positive change in communities in DR Congo. We will bring you more news on the students' CSAs as the summer progresses. Thank you for your continued partnership in making accomplishments like this possible! For Saturday, May 18 the school grounds of Centre Salisa school became a stage. 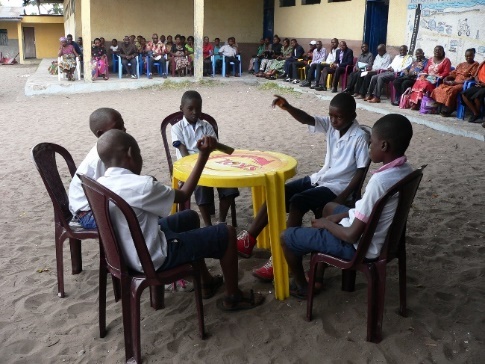 Surrounded by their families, teachers, peers and special guests, theatre in the round-style, students performed lessons to educate about the managing waste. Students drew creative energy for their performances by talking with waste management professionals, viewing bodily waste samples under a medical clinic microscope and from neighborhood walks where they evaluated the impact of waste firsthand. These inspirations prompted the students to clean their classrooms on a daily basis, arriving at school before even their teachers to clean. Songs, skits and poems teach in fun, accessible ways the need to keep the environment clean to prevent diseases and erosion by collecting waste and disposing of it properly, reusing or composting. Students entreated attendees, and parents in particular, to work together and support each other to minimize the dangers of waste by good management. Special guests watched with pleasure and support as the students demonstrated their learning. 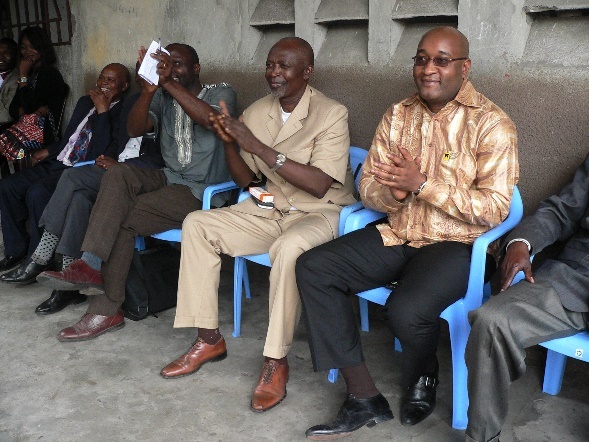 Representatives from UNICEF, World Vision, and Rotary joined the Assistant Mayor of Mpasa II, Nsele City, the Police chief of the National Intelligence Agency, President of the National Association of DRC Parents and Water and Sanitation Coordinator and Manager of Institut Supérieur des Techniques Médicales Kasangulu. "What the children said here only means that we parents have not made an effort to manage a healthy environment, which causes high rates of mortality and morbidity. We must not limit ourselves here but must bring these lessons to the community." Students are looking ahead to turning their performances them into action. All the learning about waste leads to student driven Community Service Actions, community service projects targeting public education of the disposal, re-use, and long term health aspects of waste management practices.